Nathaniel Chalobah offers a stark contrast to the rest of this season’s incoming transfers. It’s not that the Chelsea youngster has grown up in England and is used to English football, not that he has no (discernible) links to Udinese or the Pozzo family; no, the unique thing about Nathaniel, and the thing that makes him very popular around these parts, is that there is a wealth of information on him available on the internet! They may not ever get to see them progress to the youth team, but there is a host of literature on youth team players, including a dedicated wiki, full of facts and figures. Wonderful. Chalobah, of course, has more than most. Before Ryan Bertrand was thrust into first team action in the Champions League Final last season, having made his name at a number of Championship clubs on loan, the last genuine success story from the Chelsea Academy was England’s Lionheart John Terry – there are many fans in West London who hold very high hopes that the Sierra Leone-born 17 year old could be the next. Captain of both the Reserve and Under-18 squads at Chelsea, as well as the England Under-19 team, he has excellent credentials; and though he may not have made his senior debut just yet, he’s got plenty of experience in winning things. 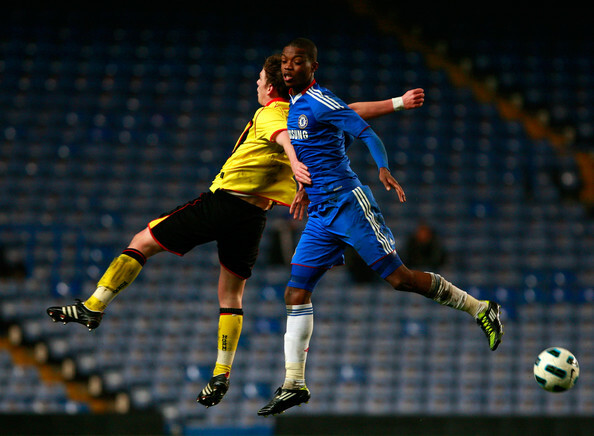 In the summer of 2010, Chalobah, 15 at the time, was the youngest player at the under-17 European Championships, and was the youngest in the 18-boy England squad by 375 days. This didn’t stop him starting every game at centre back as England swept away all comers to win their first ever European title in that age group. The team took a lot of plaudits from the media for playing football with a verve and style completely alien to the senior side, helped no doubt by the comfort on the ball that most reports attribute to Chalobah. The following year, Chalobah was captain of the side as they reached the semi finals of the European Championships, losing to the Netherlands, before heading to Mexico for the Under-17 World Cup – Chalobah scored the winning penalty in a second round shootout with Argentina, only for the team to succumb to Germany in the quarter finals. Last season, his first as an academy scholar, he combined youth team and reserve team duties – leading the former to the FA Youth Cup title, even scoring in the first leg of the final against Blackburn. Many Watford fans will remember Chalobah from the quarter final defeat in said cup two seasons ago, when a team featuring Sean Murray, Jonathan Bond and Tommie Hoban lost 2-1 at Stamford Bridge to Chalobah’s Chelsea. On that particular occasion, the versatile youngster was stationed in midfield, a position that he has taken up many a time for his club, and ran the show. His lack of concrete first team experience does not mean that he has not been involved. Chalobah is used to playing above his age group – he made his under-18 debut at the age of fifteen years and one month – and the following pre-season went on tour with Carlo Ancelotti’s first team squad. The hefty Italian even saw fit to give him 45 minutes against Dutch giants Ajax as a young team lost 3-1 at the Amsterdam Arena (If you think Watford fans can be knee-jerk, check out this match report). Generally, players move up age groups in youth football because they have developed physically quicker than their peers – this is often cited as a downside of English youth football, putting too much emphasis on physical prowess, and not enough on technical ability. This doesn’t seem to be the case with Nathaniel. He may be tall (6ft 1in) but is reportedly not especially strong, instead relying on his composure and reading of the game. Vital Watford’s chat with the guy who runs the @ChelseaYouth Twitter account, well worth reading for more informed opinion on Chalobah, reveals that he is ‘a willing recipient of the ball’ and an ‘adventurous passer’ – words that will be music to the ears of Gianfranco Zola – and that his abilities allow him to skirt between midfield and defence very easily, though his long-term future remains in the heart of defence. There’s no doubting that Chalobah is a great prospect, and his name has been around for so long that his tender age comes as a huge surprise. But, not eighteen until December, will he have the presence to force his way into the team, especially with so much competition around? The fact that he’s here in the first place suggests he will. The likes of Neuton and – goes to check website – Joel Ekstrand arrive from Udinese under no obligation to play. The latter saw a move to FC Twente fall apart on deadline day, meaning he rocked up at the Vic instead. Much has been made of their signings being made over Zola’s head, but all their presence does is add to the pool of players at his disposal. Chelsea, on the other hand, would not have allowed one of their most prized youngsters to have come on loan unless they expected him to get some serious game time. I can’t imagine there was a dearth of teams vying for his short-term signature, and so Chelsea must be confident that Watford will aid his development. Some will again cry out that if we’re just going to be playing seventeen year olds at the back (or in midfield) then why don’t we play some of our own youngsters. As keen an advocate of Adam Thompson and Dale Bennett as I am, I think we’re talking about two completely different kettles of fish here. Thompson is already, in my opinion, a Championship quality defender, though he is more suited to playing right back, whilst Bennett, with a bit more consistency, could be too. In Chalobah, however, we have a player who plays above his age. He won’t be the finished article yet, of course he won’t, but this is a player who’s credentials suggest could play at the very top. Tom Cleverley and Ben Foster transformed their respective Watford teams, and returned to Manchester United as stars – though regular football will do Bennett and Thompson the world of good in getting them to Championship quality, a good showing at Championship level could be the step ladder to Chalobah becoming something much bigger. Not to put too much pressure on him. He may have an old head on his shoulders, but he is still seventeen, so whether the rigours of Championship football are coming just a bit too early for him remains to be seen. But hey, it’s not as if we don’t have the numbers to replace him is it?